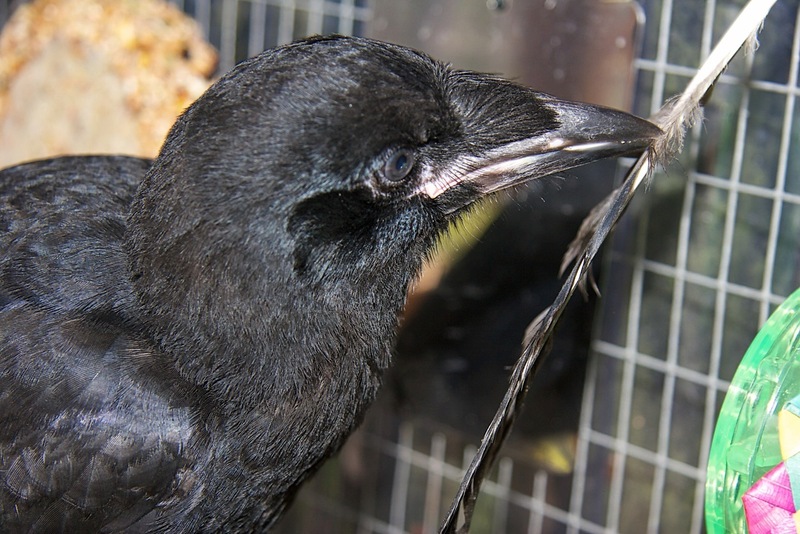 One of the most important aspects of corvid rehabilitation is the provision of a natural diet, environment and associations that ideally duplicate what corvids would be exposed to in the wild. This can be achieved by building and furnishing aviaries with this goal in mind. 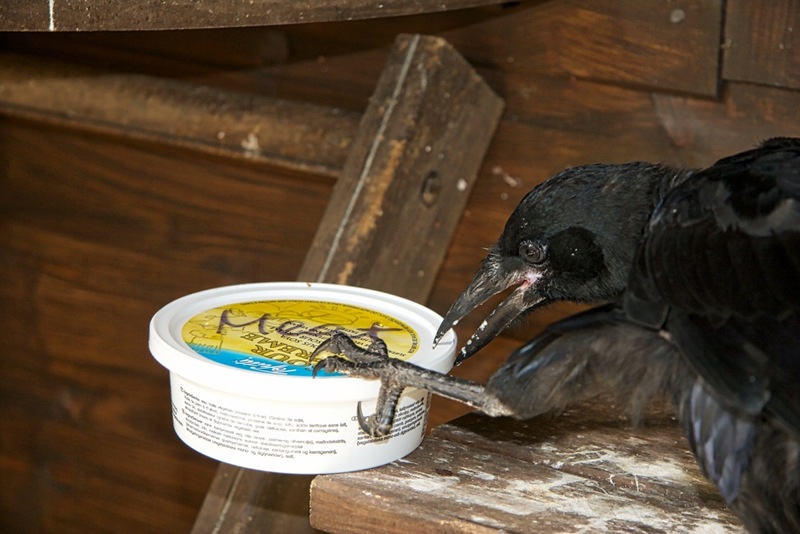 Since the majority of corvid rehabilitation deals with orphans, this approach is especially critical to releasing strong, robust, well-adjusted corvids that will go on to survive in the wild. However, theory and reality are as always slightly different. This is particularly true when corvids are being cared for longterm, which is quite often a necessity and will give them the best chance of survival in the wild. Sadly, in reality, many rescues will not give these birds the chance they deserve, because long-term rehabilitation is time consuming and financially demanding. Many of these birds will be either put to sleep straight away, or will even be prematurely released. Lets start with some basic considerations. 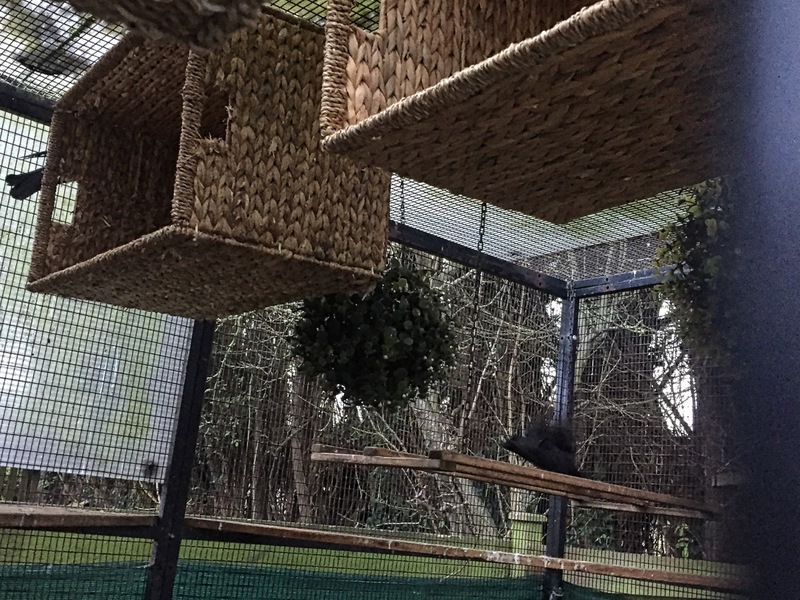 When contemplating the aviary size, then experience shows that an aviary is never to big, but always to small, which becomes in particular obvious when furnished. When choosing the aviary location, one should make sure that it is easily accessible for caregivers, while keeping it away from public areas and pets. Corvid aviary materials are also of great importance, as corvids are generally very destructive. This means that these birds will definitely put any aviary to a test. Over time wooden rafters will be chiselled away, which automatically implies that wood preservatives being used have to be safe for birds. Wooden aviaries have to be continuously inspected to make sure that they remain safe, keeping birds inside and predators out. Metal aviaries are obviously more resistant, but are also more expensive and require generally more effort when it comes to furnishing them. The mesh size should also be chosen according to the species to be housed. Plastic mesh is not a viable option for any kind of corvid aviary. It is well known that corvids will cache their food, which is going to attract not only rodents, but also insects, snails and slugs. In that context, it is important to understand that worms and other parasites are being transmitted by snails and slugs, which can seriously affect the health of all but in particular recovering or immunocompromised birds. Cleaning up the cached food keeps your aviary clean and your birds healthy, but no necessarily happy, as corvids have their very own idea, what a tidy aviary and home should look like. It is advisable that a corvid aviary has at least two of its sides completely covered, to give birds a safe and sheltered place to retreat. Having the sheltered area away from the entrance door ensures that frightened birds will be able to move away from the person entering the aviary, allowing them to retreat towards the shelter area. Wooden panels work well, but other materials like fabric or synthetic sun shade and windbreak mesh, as used in greenhouses, can also be used. However, when using the latter, one has to bear in mind that corvids will most certainly tear and destroy these materials, and long pieces of twine will pose a strangulation hazard, if remaining undetected. The aviary roof should be partly covered to protect the animals from the elements. But there should be also areas in the aviary, where birds are able to enjoy sunshine, rain or snow. Double entries or safety porches are definitely desirable, but will naturally decrease the available aviary space for the birds. 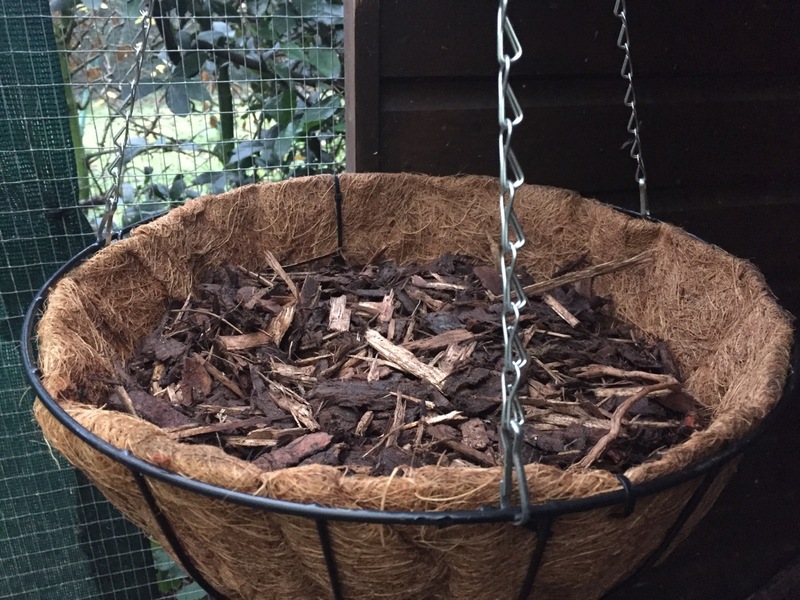 Sheltered areas can be easily created by using straw or seagrass baskets, which work particularly well for smaller corvids like jays or jackdaws. When building an aviary, a common goal should always be to incorporate as many natural elements as possible, to create a natural habitat mimicking environment. However, the feasibility of this ideal case scenario depends on the number of corvids being kept. A meshed rat proof natural dirt floor with gras and bushes is certainly ideal, but more difficult to keep clean and hygienic. This problem increases proportionally with the number of corvids being kept. It is only a matter of time until a beautiful meadow is completely destroyed and bushes have lost all their leaves. Only very hardy plants, which have to be obviously safe for the birds, will survive, but does usually only for limited period of time. It might be necessary to replace or at least to rotate these plants on a regular basis. In contrast, concrete flooring is easy to keep clean and to disinfect, but it is obviously not natural and can pose a health hazard for birds having temporary or permanent disabilities, like the ones being prone to falls. 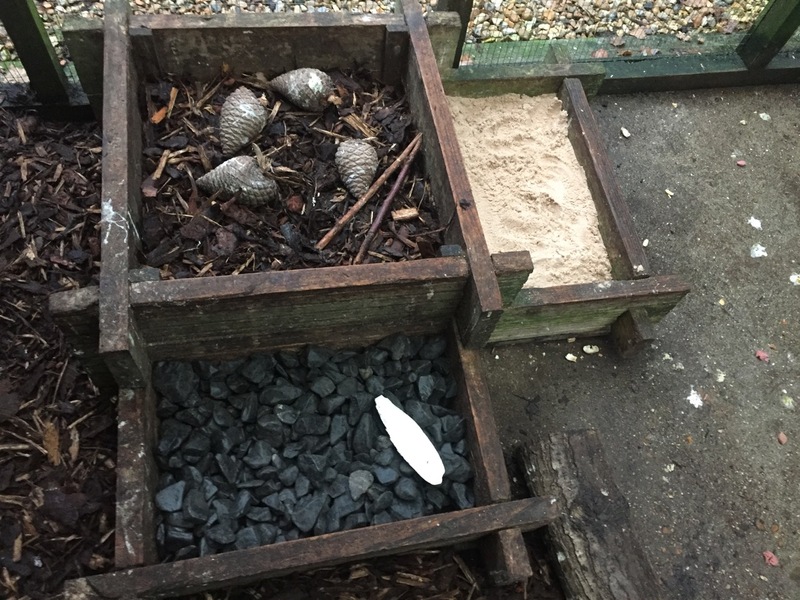 A compromise might be to create a concrete floor aviary with added confined areas of different substrates, like an area of wood bark underneath a common seating and roosting area, which dampens a potential fall. Artificial grass or astroturf might work as well, however, it can be difficult to maintain, especially when more than two or three birds are being kept in this aviary. There is also a risk of debris accumulation underneath grass mats. As said already before, it is also very likely that corvids will destroy and possibly eat parts of the grass mat or carpet being used, which can potentially cause gastrointestinal problems. Alternatively, one could also create a confined patch of natural gras, sand or grit, which provides a great playground, is slightly easier to maintain and to replace, which also avoids the buildup of contaminants. Depending on the size of the aviary and number of birds to be kept, it might be necessary to integrate a drainage system, which will help to maintain basic hygiene levels and will reduce the built up of contaminants being distributed beyond the aviary boundaries by water run off. This helps to keep aviary birds healthy and avoids cross contamination affecting other wild animal species living in the near vicinity. When creating a sheltered area for birds to hide and roost, one has to always make sure that all birds are able to reach this area easily and safely. This also implies that the furnishing of the aviary has to be based on the abilities of the animal with the most severe disability. This makes sure that all animals can get to all essential aviary places like roost, shelter, bath and food without injuring themselves. One should also consider that disabilities may develop during the stay of animals patients, as quite commonly seen in birds with plumage problems caused by a nutritional deficiency, which may become completely grounded for a certain period of time, until they go successfully and undamaged through their main moult. If there is a risk of limited mobility, even only for a short period of time, then it is crucial to consider a variety of different sized perches and perch materials to avoid the development of an ulcerative pododermatitis or bumblefoot, which is a bacterial infection and inflammatory reaction on the feet of birds. Padded perches or block perches will help to prevent this disease, keeping birds off the ground and the plumage pristine. Thick natural ropes can also be used, as they can help to bridge distances between different aviary levels. They also help birds to train their sense of balance whist being gentle to their feet and good fun to dismantle. Astroturf or outdoor carpet, which can be used as perch or stand padding, can be easily cut to size, but might be in need of frequent replacement. Wooden shelfs or planks, strategically positioned at different levels, trees trunks of increasing height, piles of tree logs or adapted wooden ladders can also help to bridge different height levels in an aviary. Although a sufficiently sized bird bath is an essential part of any corvid aviary, one has to remember that the bath itself might pose a death trap for disabled birds. Positioning of the bird bath is crucial, not only to keep the bath clean as long as possible. The size and water level of the bath might need careful consideration, in particular when disabled animals are inhabitants of the aviary. Corvids generally need company of their own kind, which means that corvids should not be raised or kept by their own. All corvids species benefit from entertainment and enrichment being provided. Because corvids are generally neophobic, it might be helful to limit the number of new toys being introduced to a few at the time. As with children, it is certainly a good idea to remove old toys for a while and to reintroduce them at a later time. Toys do not have to be expensive, but natural materials should be a preference, in particular when dealing with wild releasable animals. Corvids love pebbles, stones and shells, which they like to use as toys, but also as a marker for cached food. Other natural toys are pin cones, acorns, twigs and branches. 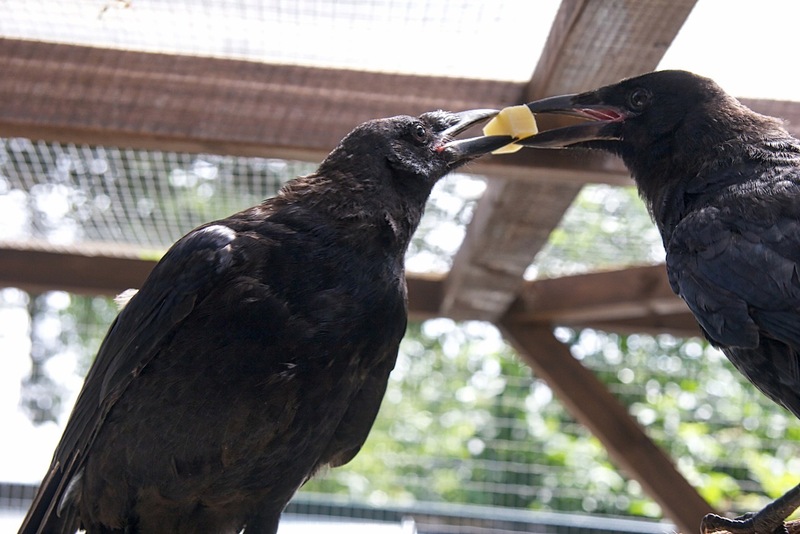 Corn on the cob is a nice treat in particular for rooks and jackdaws, as it is also a very entertaining pastime. Cuttlefish bones are often very much appreciated and are useful too, as they serve as a natural source of essential minerals and help to trim the beaks. Half rotten tree stamps are most corvids’ favourite, as almost all seem to enjoy to dismantle them. A soft tree stem is also an open invitation to dig for worms and insects, and to hide food items in crevices and holes. Children’s wooden play cubes are often well accepted and appreciated as toys. Many corvids cannot resist crumbled paper balls or toilet paper cardboard rolls. However, as these items will most certainly end up soaked in a bird bath, aviary cleaning might become truly tedious. If dealing exclusively with captive birds, the spectrum of available toys becomes much larger, as long as they are deemed safe. 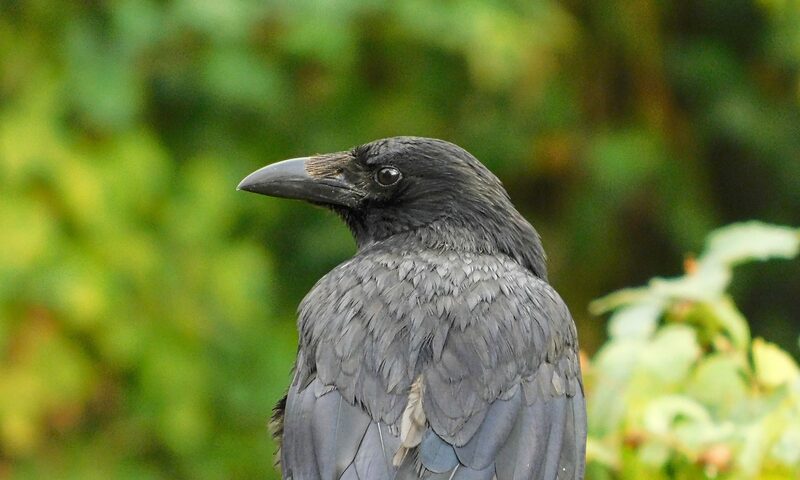 This is by no means an exhaustive list of considerations to make when planning and building an aviary for corvids, but it should hopefully give an indication of the complexity of issues and problems to consider. An aviary project gets rarely completely finished, it will more likely continue to remain an ongoing theme and might actually never come to an end. As soon as the first birds inhabit, explore and investigate the interior design of the new aviary, further changes and adaptations of the original design will most certainly become necessary.